During the 2011 Frankfurt Motor Show Audi rejoined the hybrid auto market with their latest creation, the production-ready Audi A8 L Hybrid 2013. The A8 Hybrid brings new technology to the table and boasts a highly efficient mix of performance, luxury and fuel efficiency. Let's take a closer look at what we can expect from this luxurious sedan. The A8 L Hybrid 2013 combines a 2.0 liter TFSI four-cylinder 211 horsepower gasoline engine with an electric motor that develops 54 horsepower and 155 lb-ft of torque. Together, the gasoline and electric motor will be able to develop 245 horsepower and 354 lb-ft of torque. We must point out however, that the Audi A8 L Hybrid stands out mostly due to two unique features. The first interesting part about the Audi A8 L Hybrid is that it's a front-wheel drive, and whereas the hybrids usually get this kind of treatment, sedans of this size are expected to come with either rear-wheel drive or all-wheel drive. The second interesting feature is the transmission. The Audi A8 L Hybrid comes with a modified eight-speed tiptronic gearbox in front of which Audi engineers fitted a permanent magnet synchronous motor. Judging by what the Audi engineers have reported, the outcome is a luxurious sedan able to deliver both fuel-efficient and sporty performance. 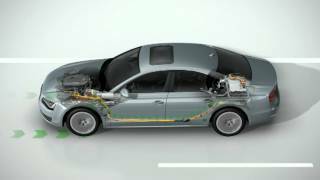 The energy storage is provided by a lithium-ion battery found at the back of the sedan, and the result of this entire system used by the Audi A8 L Hybrid 2013 is the ability to travel at roughly 62 mph on electric power alone, or cover 1.86 miles at 37 mph with zero emissions. As for fuel consumption, the standard cycle will only require 37 miles per gallon. 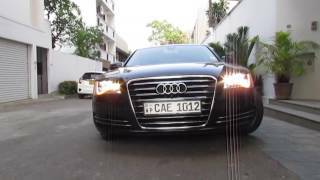 There are however three different modes to choose from while driving the Audi A8 L Hybrid. There's the EV mode which gives priority to the electric drive, D mode which engages both the electric motor and the 2.0 liter engine, and S mode, which obviously stands for Sport mode. Needless to say, S mode will not care much about fuel efficiency and will crank up the performance dial. As for the Audi A8 L Hybrid design, there's not much difference between the standard Audi A8 and the hybrid one, the later variant featuring a unique set of 18-inch wheels, hybrid badging and an exclusive Arctic Silver paintjob. As expected the Audi A8 L Hybrid comes loaded with lots of features and equipment including an optional MMI navigation system, radar-based adaptive cruise control, stop & go, camera-based speed limit detection and night vision just to name a few. As for availability, the Audi A8 L Hybrid 2013 is expected to be launched on the automotive market later this year.